Happy Canada Day from Meow! Once upon a time, the virginal Miss Canada was the symbol for our fair country. 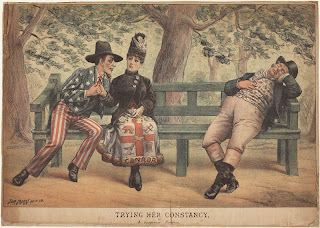 Here we see her, in a Confederation-era cartoon, being wooed by Uncle Sam while England's John Bull is caught napping. It was fear of the U.S. that in part led to the creation of the Dominion of Canada. Isn't Miss Canada exquisite? The height of fashion! I'd kill for that dress or hat! Since Meow will be closed July 1, here's hoping you have a safe and happy holiday! We will reopen July 2.